Look, I’m not saying that this isn’t an amazing time for TV. All I am saying is that labeling one year as a golden age sets you up for future failure and disappointment. For instance, people who label the 1930s and 40s as the golden age of film completely disregard the amazing work done in later years. Plus, Gone with the Wind is sort of racist and Citizen Kane is kind of boring. Earlier this year, some critics said the golden age of television was over. Really? Then how do you account for the fact that over half my list is freshman shows? As everything migrates towards cable and the web, TV is changing and currently on a curve of exponential growth. This is my first TV top ten list, because this is the first year that I feel like I watched enough shows that I could list ten and have a few honorary mentions. 10. Last Week Tonight with John Oliver In an incredible hot streak that lasted from May through November, Last Week Tonight provided the sharpest political satire on television. John Oliver took on everything from dictators to FIFA and managed to shed light on a lot of stories that actual journalists were doing a terrible job reporting. Oliver’s greatest gift is that he can take complex issues (net neutrality, civil forfeiture) and make them both funny and digestible. Oh, and every once in a while space geckos and supreme court justice dogs appear. 9. The Knick While you were busy covering your eyes during every insanely grizzly surgery scene, The Knick was busy closing the divide between film and television. It is an unflinching look at America at the turn of the twentieth century. It’s a history lesson that never feels like one because it doesn’t gloss over the squalor and the prejudice. Every episode is directed by Steven Soderbergh; slums, brothels, and ruptured body parts have never looked this pretty. 8. Review The premise of Review is simple: a man hosts a show and instead of reviewing art or food, he reviews life experiences. At first, this show is about how far this premise can go before going horribly wrong. But then, around episode three, it becomes something else. Andy Daly turns the character of Forrest MacNeil into a sociopath disguised as a nerd. There is something always so wonderfully playful about Review, even as it dives deep into the darkest depths of the human soul. 7. Game of Thrones Game of Thrones has reached that level of popularity that makes you want to punch every person who tells you that you have to watch it. Right now, every person in America (including myself), is that person. Epic in scope and scale, Game of Thrones has earned every bit of its popularity. And while splitting adaptations in half never seems to work (see Mockingjay), season four was only half of a book and yet it felt complete. This season felt the need to kill off as many characters as possible. Hey, anything George R.R. Martin can do to give us constant anxiety attacks. 6. True Detective I still have no idea what True Detective is about, and that is precisely the point of it. After months of hype and scrutiny, now is the perfect time to look back and appreciate the sheer beauty and ballsiness of True Detective. It is very easy to get lost in the story, but that is part of the point. While figuring out who the Yellow King is can be fun and all, being just as confused as the main characters are is truly the best way to watch it. True Detective is already an instant classic, with Woody Harrelson and Matthew McConaughey doing the best work of their careers. McConaughey might have won the Oscar earlier this year for Dallas Buyers Club, but his performance as Rust Cohle in True Detective is what he will be remembered for for the rest of his life. Best Episode: Who Goes There 5. Orange is the New Black Season two of the show that changed Netflix was a vast improvement on a first season that was already very strong. By taking a lot of the focus off of Piper, season two gave us backstories for a lot more prisoners who were just in the background in earlier episodes. We also got to mingle with wardens and security guards much more this season, and we got a larger sense of the history of the prison. It is always nice when a TV show takes time to actually explore the world it inhabits. Best Episode: We Have Manners. We’re Polite. 4. Kroll Show Season two showed a much more focused Kroll Show. This is not so much sketch comedy as it is a series of overlapping vignettes. From the Oh, Hello guys to Publizity, Nick Kroll has created a genius comedic world in which reality stars and bouncers are the heroes. Recently, Kroll announced that season three of Kroll Show would be its last. This is a show that has had a vision since day one, and the fact that it has already picked out an expiration date shows how committed it is to the promises it once made. Imagine if The Office or The Simpsons did that. The world would be a better place and there would be no Ebola and stuff. 3. Broad City Finally, a TV show about broke New Yorkers who don’t live in unrealistically huge apartments. Abbi Jacobson and Ilana Glazer’s popular web series was adapted into a half hour show by Comedy Central in what is arguably the greatest achievement in the network’s recent renaissance. Broad City is often described as a female Workaholics. A more accurate comparison is to Louie. While a lot of the humor is broad (that’s a compliment), Broad City typically borders on surreal. On any given day, you can get your dreams crushed and still do something amazing. Broad City is hilarious, heartfelt, and relatable on so many levels (running to catch a train at Grand Central; trying to get people to come to your art exhibition). 2. Fargo A televised adaptation of a Coen Brothers classic sounds like a bad idea waiting to happen. Hollywood is a town that is filled with bad ideas, but it is good execution that makes all the difference. Less a remake and more a continuation, Fargo flawlessly imitates the voice of the Coen Brothers. It is an acting tour de force for everybody involved (especially Allison Tolman and Colin Hanks). While it is an hour long drama, I am going to go ahead and classify it as a dark comedy. Fargo creates fanboys where you didn’t know they existed. You know how comic book fans get so psyched whenever a Captain America movie references Agents of S.H.I.E.L.D. or something else in the Marvel universe? That is exactly how I felt whenever Fargo made a reference to A Serious Man or No Country for Old Men. This is brilliant fan fiction for cinephiles. Best Episode: Who Shaves the Barber? 1. Bojack Horseman I have spent the better part of the past few months trying to convince people to watch Bojack Horseman. A normal reaction I get is, “I couldn’t get past episode one.” To that I say, “seriously, just be patient.” Bojack is both everything I have ever wanted from a TV show and everything I thought a TV show like this could never give me. If you haven’t watched Bojack, it’s about a washed up 90s sitcom star (Will Arnett), who just so happens to be a talking horse, and his attempt to make a comeback. Think of him as a much more despicable version of Valerie Cherish. In the world of Bojack Horseman, talking animals co-exist with humans, and nobody questions this. While the animals wear clothes, drive cars, and get married, the tortoise is still slow and the dog still loves to chase the mailman. For years, I have fantasized of an animated show like this. So, watching this show was partially like seeing my dreams come true. The biggest miracle that Bojack pulls off is matching silliness with sincerity. 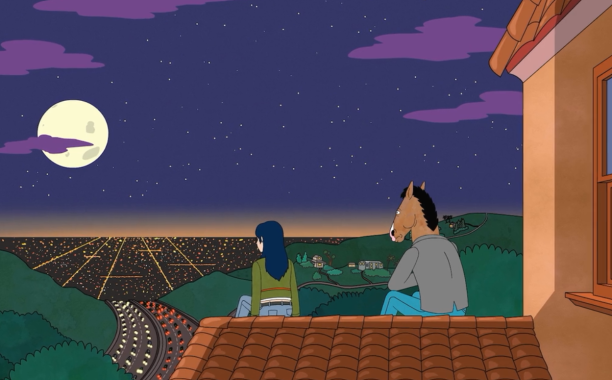 Bojack is a serious study of depression, and the best portrayal of loneliness I have ever seen. Among the many great portrayals of Hollywood that I can think of, few of them do this good a job of showing a town where perhaps everybody is working real hard to hide a deep pit of sadness in their life. In just one season, this show has established a singularly unique and dark point of view. Oh yeah, and there’s also a running gag where three kids are standing on each other in a trench suit, and nobody catches on. Bojack Horseman expresses all of the feelings, and tells all of the jokes, that you always wished you did. Honorable Mention: The Mindy Project- This is the show I most look forward to watching every week. This smart and hilarious workplace comedy is the closest thing network television has to 30 Rock right now. Plus, Chris Messina’s glasses are the funniest prop on all of television. This entry was posted in Uncategorized and tagged Analog This, Bojack Horseman, Broad City, Comedy Central, Fargo, Game of Thrones, HBO, Lists, Matthew McConaughey, Netflix, Serial, Television, The Mindy Project, Top Ten, True Detective on December 9, 2014 by ian0592.